How Indian is Ola's ownership structure? The battle for market dominance between ride-hailing companies Ola and Uber has taken a nationalistic overtone after the Bangalore-based company accused the US-based rival of disrespecting Indian law. In a submission to the Karnataka High Court earlier this week, Ola had alleged that Uber was a "foreign" company profiteering through bypassing the laws of the country. Ola, run by ANI Technologies Pvt Ltd, also alleged that Uber was indulging in murky business practices and had no regard for customer safety. Uber Technologies Inc, based in San Francisco, dismissed the allegations and said that it was as 'foreign' as Ola and that it was a global company with local roots. But is the location of a company's head office the only parameter to determine if it is Indian or foreign? We dug into Ola's filings with the Registrar of Companies for the period ended 31 March 2015 and made calculations based on data from VCCEdge, the research platform of VCCircle, to find out who actually owns the company. 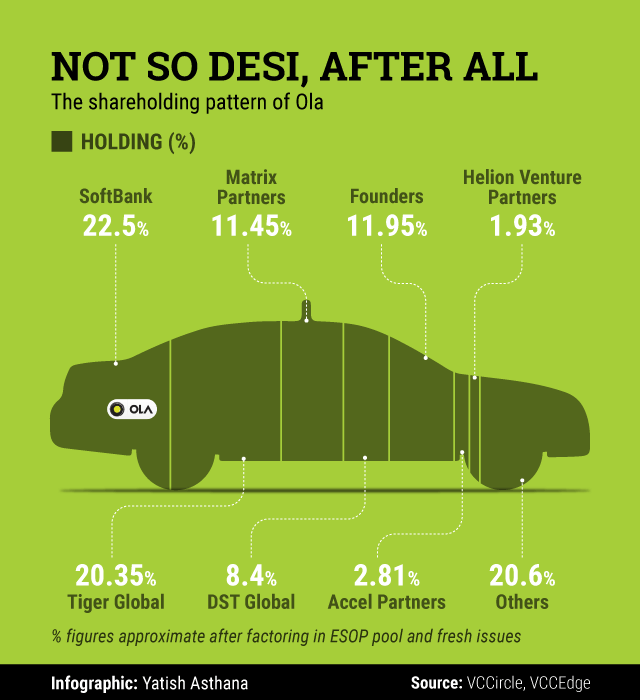 The data show that Japan's SoftBank Group Corp is Ola's biggest shareholder. Hedge fund tital Tiger Global and private equity firm Matrix Partners, both based in the US, and DST Global, the investment firm of Russian billionaire Yuri Milner, are other major shareholders. Ola's founders, Bhavish Aggarwal and Ankit Bhati, together hold only 11.95% of the company. Ola also has some individual investors including industry doyen Ratan Tata, Anupam Mittal of People Group and Rehan Yar Khan of Orios Venture Partners. The total domestic holding is just under 20%. E-mail queries sent to Ola regarding the shareholding pattern didn't elicit a response by the time of filing this report. The calculations and the shareholding pattern do not completely reflect the latest Series F round of $500 million that Ola raised from Scottish investment firm Baillie Gifford, China's Didi Kuaidi and existing investors. Estimates by VCCircle seemed to indicate that Ola is yet to file documents for about Rs 400 crore ($60 million) of the total $500 million it secured in the Series F round. This could be attributed to the fact that companies usually submit documents related to a huge fundraising exercise in tranches. However, it's unlikely that the shareholding pattern of Ola would have changed significantly in favour of Indian shareholders after this round. 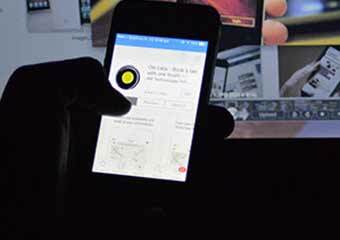 The fight between Ola and Uber has intensified in recent months, particularly after authorities in Karnataka ordered app-based transport services providers to take a licence for operating in the state. Ola obtained a licence under the new rules on June 20 while Uber has been redirected to undergo the application and inspection process once again.